Economic fundamentals in the US have been strong, and the US’s lead over the global growth aggregate has continued to widen in recent months. In August, the Argentinian peso has declined by 40.5% which triggered its central bank to increase benchmark interest rates to 60%! Unfortunately, even such drastic action fails to stem capital flights from the country. In the meantime, Turkey’s inflation rate rose to almost 18% and its central bank’s deputy governor is set to resign. And, China is about to be slapped by the US with tariffs on most exports. Gold is the only protective asset that showed negative performance in August. However, Gold provides an important insurance against the dilution of the purchasing power of paper money, and ERAA® ’s model suggest it is currently undervalued. Always focus on economic fundamentals. At StashAway, our economic-driven investment framework (ERAA® ) has helped identify the relative strength in the US economy and the outperformance of US-based asset. The US market is doing well, but the outperformance may include ups and downs; markets rarely grow linearly. Investors should not overreact to short-term down swings in Europe and Emerging Markets, or upswings in the US. The focus should be to maintain a globally diversified portfolio and stick to an investment plan, ideally by dollar-cost-averaging. In short, ignore the Fear Of Missing Out (“FOMO”). In the latest round of trade spats, Trump has signalled that the US is ready to go ahead with tariffs on an additional USD 200 billion of Chinese products. If he gets his way, almost all Chinese exports to the US would be slapped with tariffs. Trump also told the EU that their offer for zero tariffs on auto imports isn’t good enough. Additionally, he has threatened (again) to pull the US out of the World Trade Organization if “it doesn’t shape up”. Despite Trump’s incessant trade barks, US-based assets continued to outperform in August. As we have reiterated numerous times in past CIO Insights, economic fundamentals in the US are strong, and have been outperforming the global growth aggregate since September 2017. 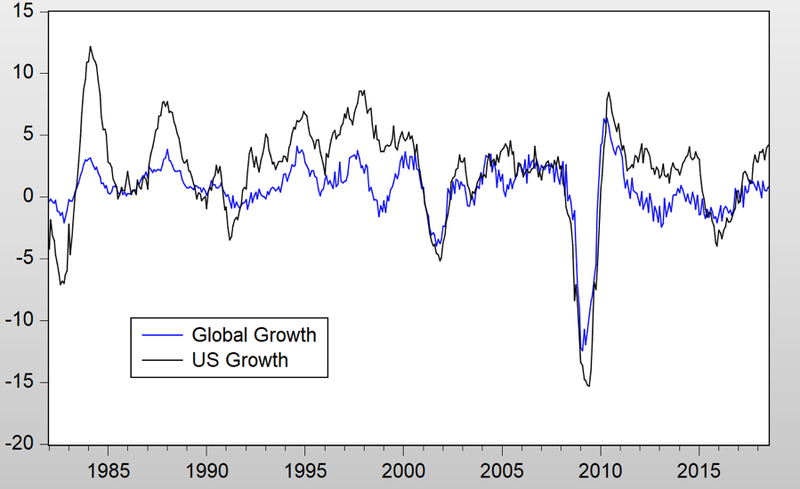 In fact, as apparent in Figure 1, the US lead over the global aggregate has widened further in recent months. This creates a favourable environment for US-based assets to outperform assets in other regions, but the outperformance is relative. Notes - growth is proxied by yoy percentage change in the industrial production of a country. The global aggregate is a proprietary index created by StashAway, and includes countries such as Brazil, China, Denmark, Europe, India, Japan, Mexico, Norway, Poland, Russia, Singapore, South Korea, South Africa, Sweden, Taiwan, Turkey, United Kingdom, and the United States. 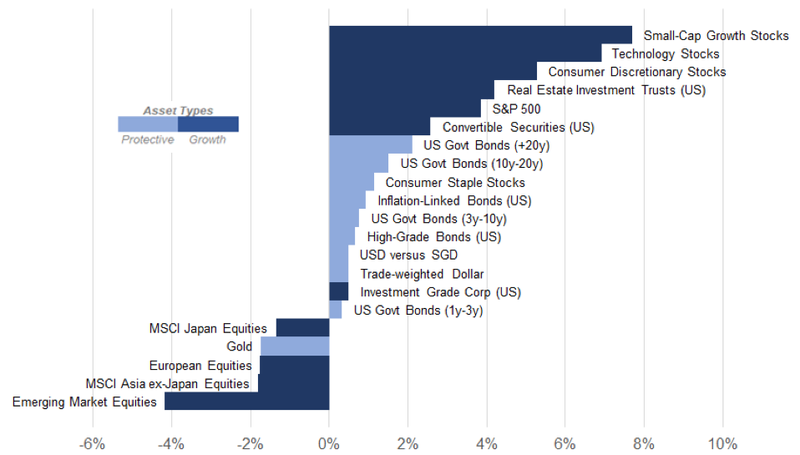 As seen in Figure 2, in August US assets confirmed the above, by outperforming other assets with the stocks in US small-cap growth, technology, consumer discretionary, and REITs gaining 7.7%, 6.9%, 5.3%, and 4.2%, respectively. Emerging markets are getting pulled down from every direction. In Argentina, the peso dropped 40.5% in August. Investors are quickly pulling money from the country, despite the central bank’s effort of raising benchmark interest rates to a whopping 60%. Then, over in Turkey, the lira hit a new low, with inflation reaching nearly 18%. And China is about to get hit with the anticipated $200 billion USD in tariffs. With no clear road out of this pile-on and the likelihood for further escalation in US-China trade tension, emerging markets could be stuck in a high volatility regime for an extended period of time. Against the macro backdrop above, Emerging Market and Asia ex-Japan equities have underperformed other asset classes with returns of -4.2% and -1.8% in August (refer to Figure 2). The only protective asset in our portfolios that is still down is Gold. Remember that Gold had a significant drawdown in December 2017, at which time our model determined that Gold was undervalued. Our system re-optimised our clients’ portfolios to take advantage of the undervaluation. Eight months later, and Gold is still relatively cheaper than economic fair value. 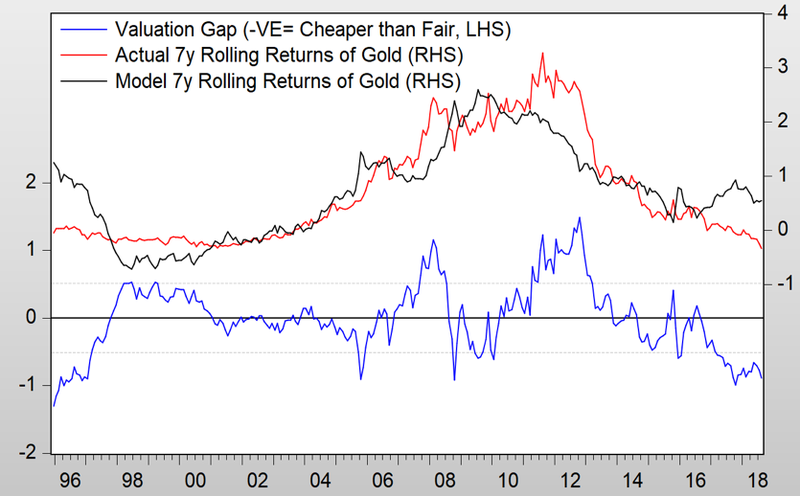 As can be seen in Figure 3, the valuation gap for Gold is still large. The divergence between actual Gold rolling returns (red line) and model Gold rolling returns (black line) has not narrowed further for more than a year. The blue line also indicates that the valuation gap is just as wide now as it was in December 2017. While Gold is still cheap, the valuation gap hasn’t budged much, so there is still much value to earn from keeping Gold as part of a diversified portfolio. On top of being undervalued, another reason to have Gold in a diversified portfolio right now is that Gold provides an important insurance against the dilution of the purchasing power of paper money. If the strong US dollar were to depreciate, the value of Gold would retain its value or even increase. In short, Gold is also an important tool to diversify away from the strong US dollar. Always focus on economic fundamentals. At StashAway, our economic-driven investment framework (ERAA® ) has helped identify the relative strength in the US economy and the outperformance of US-based assets. With the same approach, ERAA® continues to highlight that Emerging Markets are likely to be volatile for some time. Market activity such as this easily leads to emotional decision making. EM assets are cheap, but do tame the FOMO (Fear Of Missing Out) you’re feeling right now. Don’t overbuy assets that are performing well (US), or oversell them if you are worried about price level. Similarly, you should also not react to FOMO by overbuying assets that have performed poorly (Emerging Markets and Europe) thinking you’re buying on the cheap, or overselling them because you are worried about a sustained negative performance. If it means putting blinders on so that you can stick to your long-term investment plan, then by all means, put them on. You won’t capture value by overreacting; in times like these, it’s more important to ensure your portfolios are properly diversified. The markets have been doing quite well, but we can’t emphasise enough that investors need to understand that the markets will not always be this positive. Make sure you’re braced for the inevitable ups and downs by ensuring you’re comfortable with your portfolios’ risk levels. You also need to understand that short-term downs are inevitable, but are a means to higher highs for long-term investors. StashAway’s ERAA® is designed to reduce these ups-and-downs (aka “volatility” or “risk”) while maximising long-term returns, but no investment framework can eliminate volatility and give high returns at all times. Learn more about how to prepare for market downturns here: https://www.stashaway.my/r/be-smart-long-before-a-market-downturn. Lastly, dollar cost averaging will flex its muscle and prove to you how it can work in your favour as part of a long-term investment plan.